Additional Info: Gill Blythman began her musical studies at the age of 8 and gained the ALCM diploma for Piano Performance at the age of 16. She was educated at University College, Dublin where she gained a joint Honours Degree in Geography and Archaeology and a Master's Degree in Reginal and Urban Planning. Alongside her academic commitments, Gill studied organ at the Royal Irish Academy of Music under David Lee, where she was an organ scholar and holder of a number of prestigious awards, including the Coulson Exhibition and the HK Edwards Bursary. In 1984 she was the winner of the Fitzgerald Trophy for advanced organ playing at the Dublin Feis Ceoil and she was accepted as a Competitor in the Dublin International Organ Competiton in 1985. She gained the LRAM performer's diploma as an external candidate in 1990 and she has played in master classes given by Peter Hurford, who advised her that she must 'keep playing in a big way' and the Dutch organist, Ben van Oosten. Gill is a highly experienced recitalist, church organist, choir director, wedding and funeral organist, and successful teacher across all the grades. For a number of years she was director of music at St Mary's Church, Thatcham where she directed a 28 strong 4-part choir in choral services and trained the choristers for RSCM awards including Junior and Senior Bishop's Choristers and St Nicolas Awards. She also successfully trained a number of boys for Cathedral choral scholarships. Gill has been a regular recitalist in the Newbury area and also in various locations in Ireland, including the Bray Recital Series and Kilkenny Arts Week. In 2013, Gill has been a UK and International Examiner for the ABRSM. 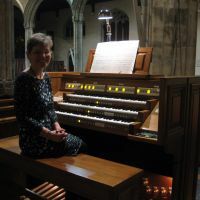 She is also currently available as a freelance organist for church services, weddings and funerals in the Berkshire / Oxfordshire / Wiltshire/ Hampshire area within a forty mile radius of Newbury.